This group of functions are available in Current case information category. Returns the id of the current process case. Returns the case number of the current process case. Returns the creation date of the current process case. Retrieves the parent identifier of a child process. See an example. Retrieves the parent identifier of a child process, without the need of context. Returns the parent process idTask for the current process case. Returns the state for the process of the current process case, it could be: Aborted, Completed, Initiated, NotInitiated, Running, Suspended. Returns or sets the actual solution date for the current process case. Returns a collection with all Sub-Processes for the current process case instance. See an example. Returns the Workitem related to a given task id. See an example. Returns a collection with the Sub-Process' sibling cases. See an example. Evaluates if cases are open for a specific case creation number. See an example. Assign a specific task (identified by the task's unique name) to a specific user. See an example. 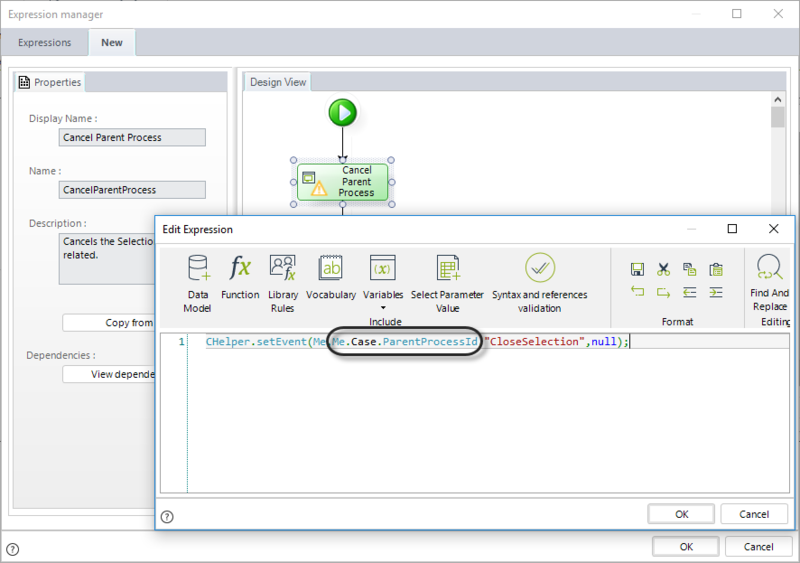 The ParentProcessId function retrieves the parent identifier of a child process. Where caseId is the child process's Id and wfClassName is the parent's WfClassName. All tests must be passed for the candidate to advance in the process. Otherwise, the job application will be rejected. 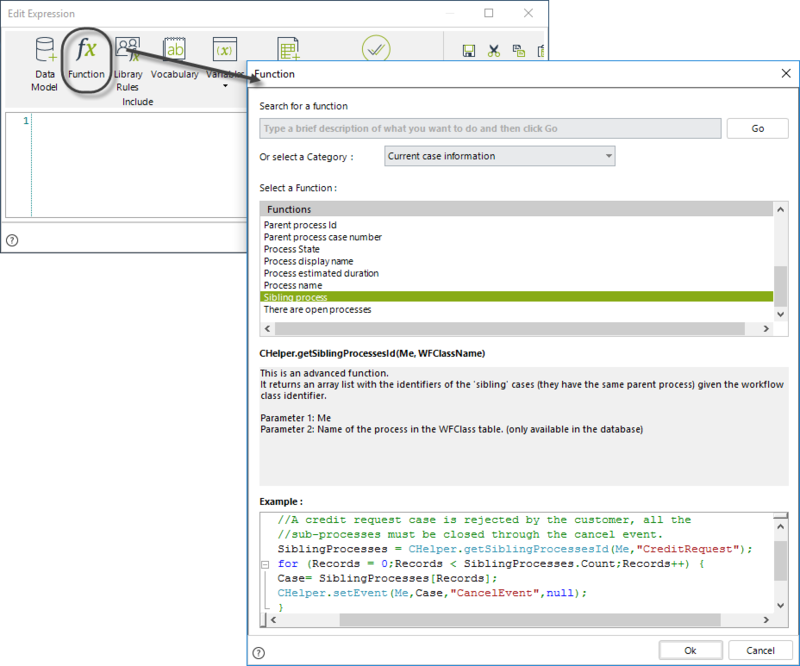 The rejection will execute the Cancel Selection Event in the parent process, from within the Sub-Process' Cancel Selection Process Task. 1. Go to the fourth step of the Bizagi Process Wizard (Business Rules) and select Activity Actions. Select the Cancel Selection Process Task in the Perform Test Sub-Process and create an On Enter Expression. 2. Add an Expression module. Include a setEvent function to execute the Cancel Selection Event. The first parameter of the function is the identifier if the parent process. Retrieve the identifier by calling the ParentProcessId function found in the Current Case Information category. You can obtain the identifier of a child process by using the getSubProcessesId function. This function returns a list with the Sub-Processes' identifiers of all the related cases. The syntax of this function is as follows. It takes the Entity context as an input parameter. Imagine a Project Administration Process. The necessary activities to complete the project are planned in the Plan Activities Task. The Perform Activities Sub-Process is launched by each activity planned. Simultaneously a task is enabled for the Project Manager to monitor the progress of each activity. The cases related to each instance of the Perform Activities Sub-Process have a private security level (please refer to Case Security); that is, only people who have performed a task within the Sub-Process have access to the case information. However, the development of each activity of the Project must be monitored by an auditor so he/she must have access as well. Select the Monitor Activities Task and create an On Enter Expression. This will execute the expression at the same time the instances of the Sub-Process are created. 2. 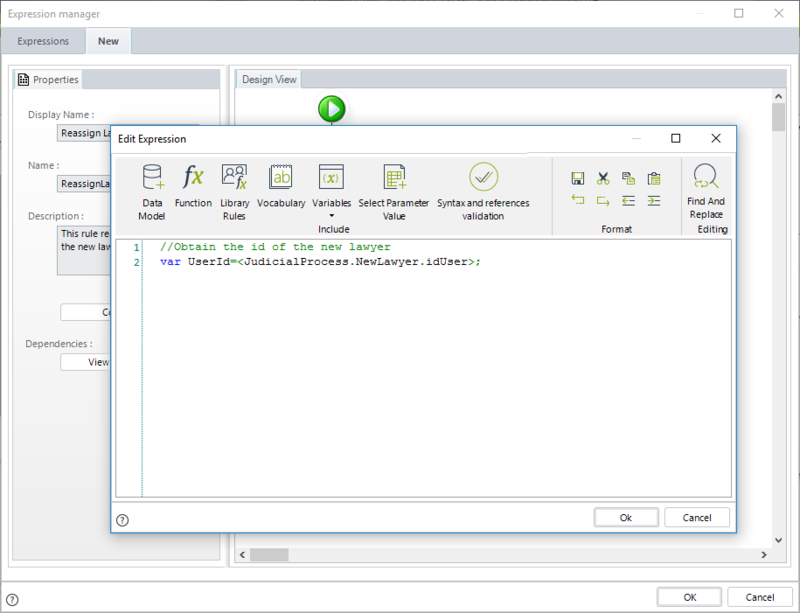 Create an Expression module. Obtain the list of associated Sub-Processes into a variable by using the getSubProcessesid function found in the Current case information category. 3. Obtain the UserId of the auditor. Use the CHelper.GetUsersforRole to retrieve a list of user Ids with a specified Role. As only one person has the Auditor Role we can extract the auditor Id from the position 0 of the list. 4. Include a FOR operator to go through the list of Sub-Processes. 5. 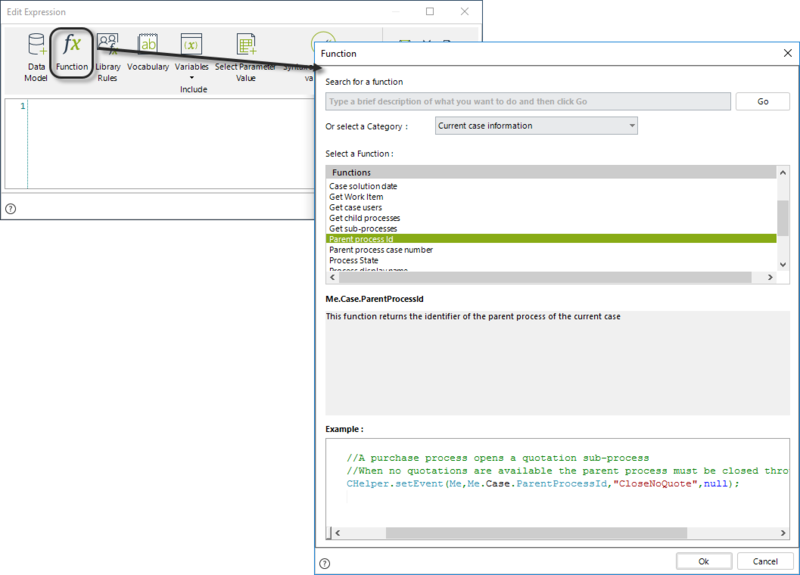 Obtain the id of each Sub-Process and use it as the first parameter of the CHelper.GrantCaseAccess function. 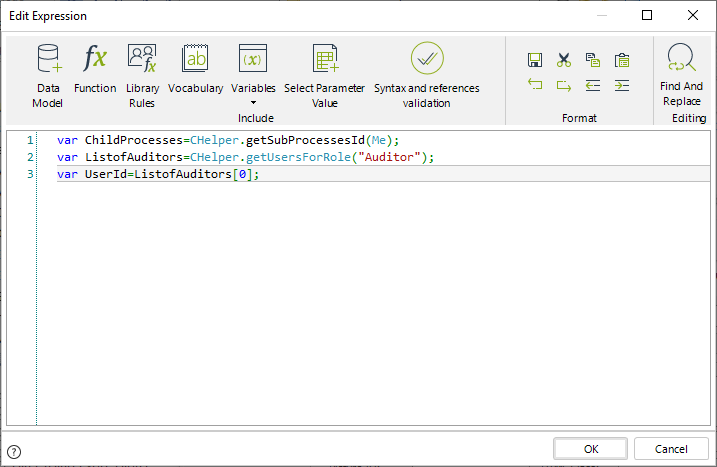 The second parameter of this function will be always the UserId of the auditor. This will grant the auditor access to the information of each Sub-Process. Obtain the Ids of sibling Processes from the current Sub-Process' Parent Process. You can obtain the identifiers of the sibling Processes (Sub-Processes with the same parent Process) of a specific Process by using the getSiblingProcessesId function. This function returns a list with the Sub-Processes’ identifiers of the current case, which belong to the class of Process (workflow) specified. 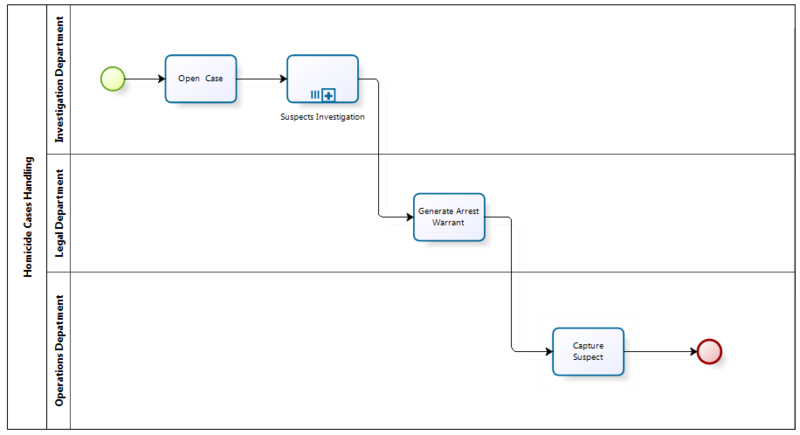 A Police Department decided to automate the Homicide cases handling Process in Bizagi. In the first Activity of the Process all the information of the homicide is entered. A list of suspects is also created in order to perform the corresponding investigations. The Suspect Investigation Sub-Process is opened for each suspect. As soon as one of the suspects is found responsible for the homicide the other investigations must be canceled and the Process continues to generate the arrest warrant and proceed with the capture. A Divergence Gateway is used to evaluate if a suspect was found responsible when the investigation finishes. If so, an expression is executed to cancel the other investigations; otherwise the Sub-Process finishes and the unsolved crime becomes a "cold case". Follow the next steps to create the expression that cancels the remaining investigations. 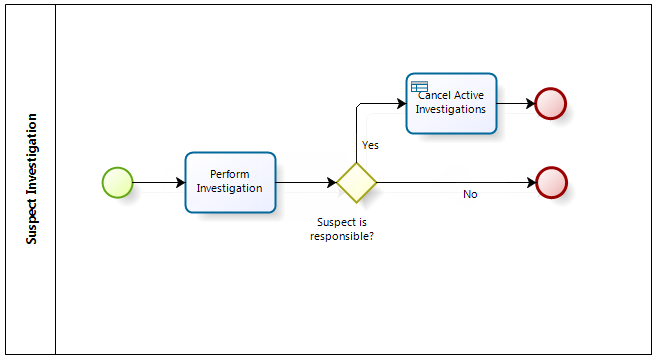 Select the Cancel Active Investigations Task within the Suspect Investigations Sub-Process and create an On Enter Expression. 2. Add an Expression module. Obtain the list of sibling Sub-Processes (other investigations) and save it in a variable using the getSiblingsProcessesId function found in the Current case information category. The parameter of this function is the identifier of the process (workflow class). To obtain this parameter, follow the steps described on How to obtain wfClassName. 3. Include a FOR operator to go through the list of Sub-Processes. •The first parameter is the sentence Me. •The second parameter is the id of the case to be aborted. In this case we obtain the Id of each Sub-Process to be aborted. oType 3 if only the parent process is to be aborted, NOT the process itself. •The fourth parameter is the abort reason, a brief description of why the case is being aborted. You can evaluate if there are open processes related to a specific Process by using the thereAreOpenProcesses function. This function returns true when cases are open for the specific case number (otherwise, it returns false). Imagine a Project Administration Process. The necessary activities to complete a project are planned in the Plan Activities Task. The Perform Activities Sub-Process is launched by each activity planned. Simultaneously an activity is enabled for the Project Manager to monitor the progress of each activity. If the Project Manager tries to close the Project when there are pending activities, that is, opened instances of the Perform Activity Sub-Process, a validation must be thrown in order to make sure all the activities are completed before closing the case. To validate that all the activities have been finished we will use the thereAreOpenProcesses function. Select the Monitor Activities Task and create an On Exit Expression. 2. Add an expression module. Evaluate if there are pending activities by using the thereAreOpenProcesses function found in the Current case information category. Set the Me.Case.CaseNumber function as parameter. 3. When there are pending activities, the function thereAreOpenProcesses returns true. Then, a validation must be thrown. Include the message that will be displayed. You can obtain the WorkItem related to a specific task by using the Me.Case.getWorkItem function. This is specially useful to get or set information of a task from any other task in the process by specifying the task's unique name. In a Customer Service Process a timer event is used to remind the case expiration of a request. According to the nature and necessary actions to assist the request, a customer service agent can modify the initial due date. 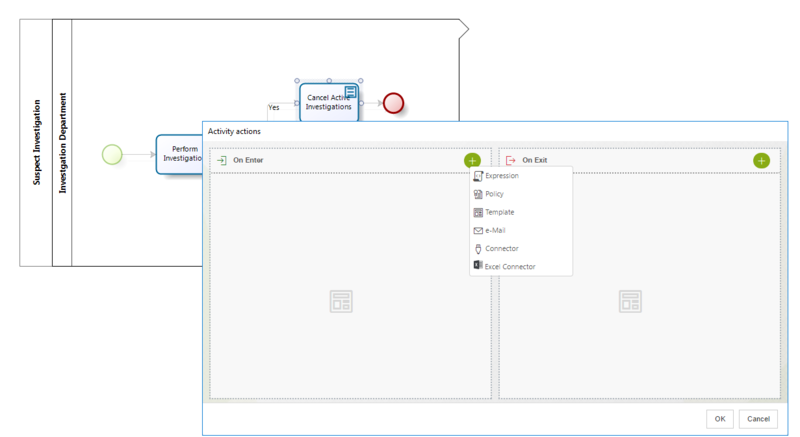 This update can be done from any task of the process by changing the value of an attribute of the data model called DueDate. Create an expression as an on exit action of the task from where the timer duration can be updated. Use the Me.Case.getWorkItem function using the name of the timer event as a parameter. For this example this name is DueDateReminder. Now apply the .EstimatedSolution method over the WorkItem object to set the new timer duration. You can assign a task to a specific user using expressions with the Me.Case.assignWorkItem function. •UserId: Id of the user to which the task will be allocated. •Replace: Boolean value. If the boolean is true, it will replace all assigned users. If it is false, the user will be added to the assigned users. 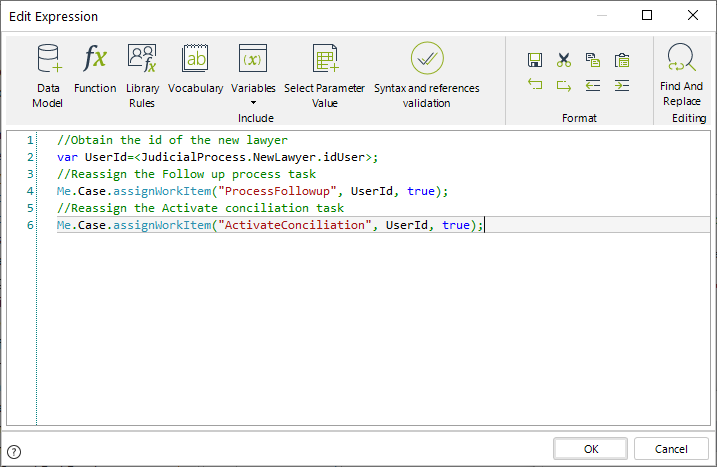 An insurance company uses Bizagi to manage its Judicial processes. At the beginning of the process, a lawyer is allocated to perform the process follow-up. Anytime in the process, the Legal affair manager can reallocate this lawyer, to do so, an intermediate event is enabled. Once the Legal affair manager chooses the new lawyer in the event, the activities currently allocated to previous lawyer must be reallocated to the new lawyer. Suppose these are two activities: Follow up process and Activate conciliation. To reallocate the lawyer, an expression is defined as an on exit action of the event. Select the Event from which the new lawyer is selected by the Legal affair manager. 2. Add an expression module. Obtain the id of the user to be allocated. In this case, the IdUser of the new lawyer. •Follow up process = "ProcessFollowup"